Discover the exciting city of Tel Aviv at the Sheraton Moriah Tel Aviv. Our beachfront location overlooking the Promenade and the Mediterranean Sea is both relaxing and fun. A hotel with unique Israeli flavor, we offer a great location for business and leisure travelers alike. Local shopping, museums, theaters, and nightlife are just minutes from the hotel, as is the local business district. 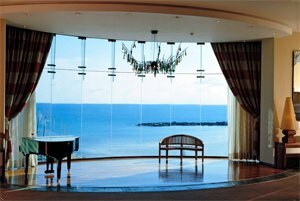 Our New York banquet hall, located on the 18th floor, overlooks the magnificent blue Mediterranean Sea. It is a great venue for exclusive and intimate celebrations or business events. The superb cuisine of Chef Golan Israeli makes any affair a great success. Offering a variety of advanced services in a relaxed, professional atmosphere, the Sheraton Moriah Tel Aviv promises warm and friendly hospitality. Take Ayalon Route 1 west to Ayalon Highway North. Exit the highway at Rakevet and take Arlozorov Street west to Hayarkon Street. Turn left onto Hayarkon Street. The hotel is located on the right. Take Interstate 2 (Haifa - Tel Aviv) south, and turn right to Rokach Boulevard at the bridge. Proceed west to Hayarkon Street and then turn left. The hotel is located on the right. Take Interstate 4 to the Ganot intersection, and follow the signs to Tel Aviv. Exit Ayalon Highway at Rakevet. Proceed west on Arlozorov to Hayarkon Street and then turn right. The hotel is located on the right.